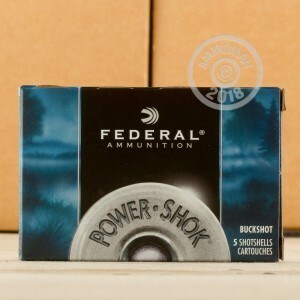 Federal offers a powerful hunting round with their 12 gauge Power-Shok 00 Buckshot ammunition. 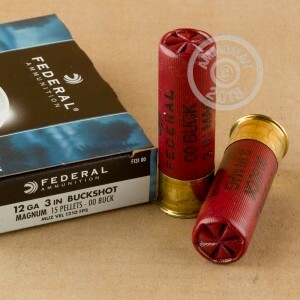 The 3" shells packed with 15 pellets with 00 buckshot are perfect for hunting and will provide plenty of power to take down a deer. 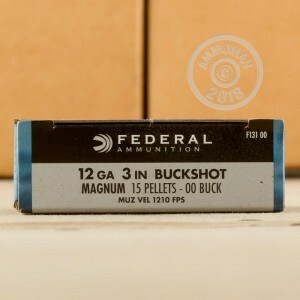 These shells fire at a muzzle velocity of 1,210 fps and feature a Triple Plus wad system providing better shot alignment. As a hunter, you often only get one shot -- these shells will do the trick. Federal's Power-Shok line is loaded in the Anoka, Minnesota plant owned by Alliant Techsystems, Inc (ATK). They are based out of Minneapolis and own several other reputable brands such as CCI, Blazer, and Busnell under the Vista Outdoor umbrella. Purchase this case today and get Free Shipping from AmmoMan!